We get it. You’re ready to get out of your home, and you’re ready to get out as soon as you can. Maybe something life-changing happened to you, and you’re not able to take your time with selling your house. 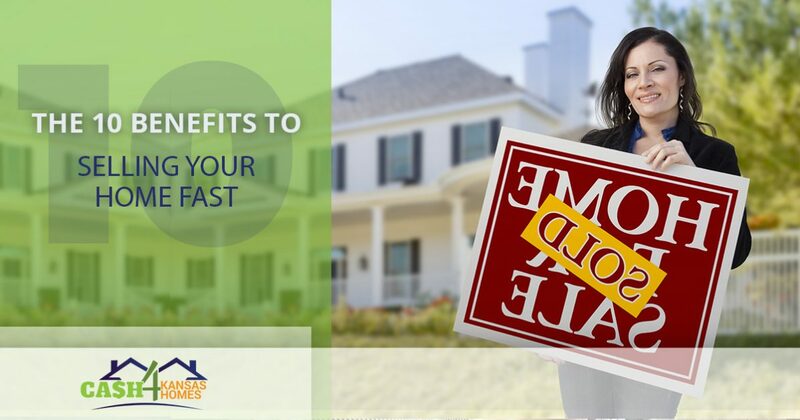 There are many benefits to finding a cash-for-home buyer and selling your home quickly, rather than putting your home on the market in the traditional way. At Cash 4 Kansas Homes, we’re in the business of home and property investment because we find joy in making the process of selling your home fast and easy. Want to sell your home for fast and easy cash? Reach out to our team today! Below, we’ve listed 10 of the benefits to selling your home fast through a home investor. 1. It can save you time. The traditional way of selling your home through a Realtor is lengthy and pricey. First, you’ll have to find a real estate agent you trust, then you have to spend some money on advertising and open houses, then you’ll maybe get a few asking prices that could fall through. Most Realtors even require an average listing agreement for as long as half a year. By selling your home quickly through a home investor, you’ll be able to close the deal right away. Cash 4 Kansas Homes’ buyers can often conclude the buying and closing process in less than 30 days. 2. You’ll avoid Realtor fees and commissions. Unfortunately, real estate agents don’t work for free, and most will take an average of 6 to 7 percent of the money made from the sale of your home for their fees and commissions. So, for example, if you sell your home for $300,000, a real estate would take about $18,000 from that sale for themselves. At Cash 4 Kansas Homes, we believe you should get 100 percent of your selling cost, and we think it’s wrong to ask for any of that money back. We never have any fees or commissions — just an old-fashioned, fair trade of goods for cash. 3. You can sell your home in any condition. Is your home not exactly in the best shape? Is it old, or maybe even falling apart? Is that making it difficult to sell or to even find a Realtor in the first place? Opting to sell your home through a home investor will save you from the headaches of worrying about how aesthetically appealing your home is. The home buyers at Cash 4 Kansas Homes can see the beauty in any home, and we aren’t very concerned with how damaged your home looks. 4. You can sell your home, even if there’s a financial burden in the way. Did you perhaps inherit an unwanted property, or does your home have a significant financial burden from damages? Home investors account for this factor when they look at buying your home so you won’t have to. At Cash 4 Kansas Homes, we pay fast cash for homes in any condition, which allows our customers to reclaim their freedom by getting rid of unnecessary, burdensome properties. 5. You won’t have to fix or clean up your home. A lot of the times, when you sell your home through a traditional Realtor, you’re convinced to replace flooring, improve the landscaping, install new roofing, touch up the painting and more. These improvements don’t come cheap, and they don’t happen quickly. A home investor buys your home exactly as it is, so you won’t have to waste your time or money on improving the home you’re about to move out of. If repairs are necessary, Cash 4 Kansas Homes will take care of them ourselves, saving you the stress and headaches. 6. You’ll be able to avoid foreclosure. Let’s say you’re behind on your mortgage payments, inevitably facing home foreclosure. It’s stressful and scary, and we get it. When your home is in foreclosure, you usually only have about 90 days to sell your home in order to keep the foreclosure from completely happening. When you sell your home to Cash 4 Kansas Homes, you could avoid foreclosure and we’ll give you the cash you need to move on with your life worry-free. 7. Fewer sales will fall through. Cold feet doesn’t just happen at weddings. Sometimes, interested homebuyers will change their minds or will experience unexpected financial drawbacks, leaving you in the dust and having to relist your home. When you sell your home with an investor, you make the deal happen quickly, meaning you’ll get the money from your home sale sooner. At Cash 4 Kansas Homes, we only make fair, all-cash offers on the homes we are completely serious about buying. 8. You’ll finally be able to get out of your less-than-great neighborhood. If you live an an area that isn’t booming with home sales, whether that’s due to a high crime rate or you live in a noisy area, it can be difficult to even find a real estate agent willing to tackle your home because most buyers likely won’t be interested. Home investors won’t be living in your home, so they don’t necessarily care what the neighborhood is like. At Cash 4 Kansas Homes, our goal is to purchase your home and flip it so it’s a home anybody could want despite the neighborhood it’s in — allowing you the opportunity to get out! 9. You won’t have to experience the relisting process. Traditional real estate agents require written agreements that set a certain amount of time they have to sell your house. If they can’t sell your home within that time frame, you’ll have to relist either with the same agent or a new one. This can make the home-selling process even longer than it usually is, especially if your real estate agent isn’t very good. Home investors are purchasing your home for themselves, meaning the deed gets done as quickly as possible in order to save you and the investor time. 10. You get straight-up cash for your home. OK, let’s be real: Who doesn’t love seeing wads of cash in the flesh? Who doesn’t love cash in general? Selling your home for cash is rewarding because you’ll immediately reap the reward of your home sale. If, either before or after reading this, you’ve made the decision to sell your Kansas City home, let our team of experienced experts help make the process as efficient and easy as possible. At Cash 4 Kansas Homes, our cash home buyers have more than 50 years of combined experience under their belts, and we’re proud to help homeowners sell their homes with no hassles or obligations attached.